Omron shows Firefox Phone with Japanese IME; Japan introduction on the way? It's late, it's hot and clammy, and work is beckoning early tomorrow morning, so I will keep it short: Omron is showing a Firefox OS phone with a Japanese IME based on their Wnn system for Android at the Wireless Japan exhibition in Tokyo. KDDI is considering introducing a Firefox OS phone in Japan, citing the openness and simplicity of application development as selling points in favour. Me, I would certainly consider a Firefox OS phone, at least as a companion phone to my Nexus 7 tablet. It'd give me the best of both worlds, with an inexpensive phone that can be mostly a phone with lightweight web apps; and a tablet for running larger, heavier Android apps and games. Most important apps I use are already web apps after all. Edit: the rest of the interview is paywalled, but let me expand on the point he made about the nascent third-platform ecosystem: Tizen and Microsoft phone are both really just more of the same, and don't actually bring anything new to the market compared to giants Android and IOS. Jolla and Ubuntu Phone do bring interesting new things, but neither are anywhere close to wide rollout yet. Firefox OS is getting ready for prime-time and really has the same selling proposition as Chrome OS: the web is your application platform. It's meant as a satellite device, so it can be more lightweight — and thus cheaper ­— than other platforms, and it does an end-run around the application availability problem by simply treating the ever-present online version of stuff as applications in their own right. UPDATE: Nikkei article now online (in Japanese and behind a registration wall). UPDATE 2: The government Consumers Affairs Agency has an official announcement here (PDF). All I can say is just WOW! iPhone 5 75 Mbps LTE service [Band 1 (2100 MHz)] was extremely limited at launch. In addition, The stated plans for expansion to 96% was limited to the LTE bands used by Android smartphones [Bands 11 and 18 (1500 and 800 MHz)], and there were in fact no plans to expand iPhone LTE coverage. Thus, as of March 31, 2013, iPhone 5 75 Mbps coverage is at only 14% of the population. 96% coverage including the iPhone by April 2013. Back around the announcement of the iPhone 5, I recall being utterly amazed that AU by KDDI could build out their 2100 MHz (Band 1) LTE network from 0 to cover 96% in about half a year. Their existing network relied on 1500 and 800 MHz (Bands 11 and 18), which is what their other smartphones are using. I don't recall saying anything at the time, but I should have because it was indeed too good to be true. The 96% was the coverage percentage NOT for the iPhone network but for their OTHER networks. 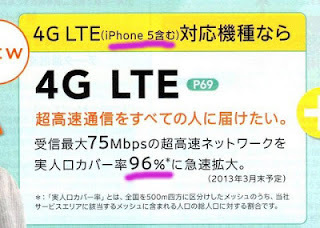 The predicted coverage rate by April 2013 for KDDI's 2100 MHz iPhone LTE network was actually 14% at the time advertising was produced. The excuse I'm hearing is that the advertising team used the wrong information. 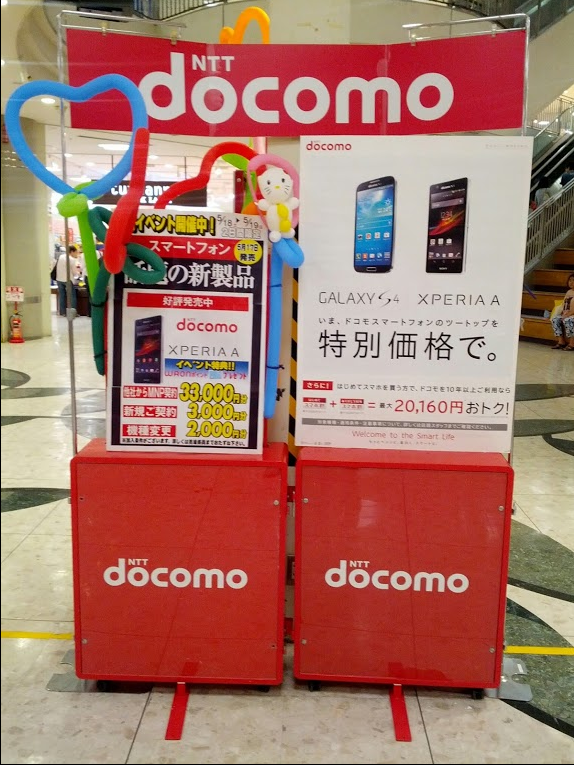 Docomo has increased the discount to ¥20,000 on it's two "must have" phones, the Galaxy S4 and the Xperia A. The two discounts together can lower the total cost to the user to just ¥5,000. Obviously, these are targeting the crowd still clutching desperately to their feature phones. These same users tend to be long-time users of Docomo. 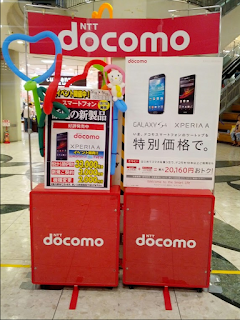 Docomo has been getting killed by KDDI and Softbank, with 1.4 million mobile numbers ported out in 2012 alone. Around the world, Android and especially Samsung are taking the market from Apple's iPhone — except in Japan where the iPhone still dominates. Scary for Docomo, that all those walled garden, loyal i-mode users who pay for the "value" added services might be wooed away by the iPhone. However, there are also positive signs. For example, the year-over-year contract numbers increased for the January-March quarter after Docomo released the Xperia Z. Kato said they "try many things based on the customer response during January to March, and the summer model will be a trigger". The GALAXY S4 (SC-04E) includes a 5 inch organic EL full HD display(1080 × 1920 pixels). The black and white models went on sale May 23, and the "Blue Arctic" domestic-only version will be released in mid June. The Xperia A (SO-04E) is the domestic version of the Xperia ZR that Sony announced on May 13. It is 4.6 inches with a 720 × 1280 pixels display. The Xperia includes a number of "galapagos" features, such as water resistance, one segTV and Docomo's NOTTV It was released on May 17 in 4 different colors.